the Divine Majesty of Your heavenly Father. Amen. that leads to eternal salvation. as much as I should love and desire to love You. in this state, then let it be so. I don’t want to escape from it. and to obtain the prize due to strong souls. the temple of the Holy Spirit. of your little spiritual ship. Stay with me, Lord, for You are my life and without You I am without fervour. Stay with me tonight, Jesus, in life with all its dangers, I need You. 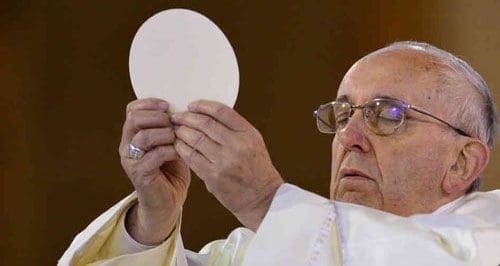 Let me recognize You as Your disciples did at the breaking of the bread, so that the Eucharistic Communion be the Light which disperses the darkness, the force which sustains me, the unique joy of my heart. Stay with me, Lord, for it is You alone I look for, Your Love, Your Grace, Your Will, Your Heart, Your Spirit, because I love You and ask no other reward but to love You more and more. With a firm love, I will love You with all my heart while on earth and continue to love You perfectly during all eternity. Amen. Say: Our Father….Hail Mary….Glory Be…. Say: Our Father…Hail Mary….Glory Be…. Say: Hail, Holy Queen and add: St. Joseph, foster father of Jesus, pray for us. My Lord Jesus Christ, Who, for the love You bear towards men, remain in this Sacrament night and day, filled with compassion and love, waiting, calling, and welcoming all who come to visit Thee: I believe that Thou art present in the Sacrament of the Altar; I adore Thee from the abyss of my nothingness, and I thank Thee for all the graces Thou hast given me, particularly for having given me Thyself in this Sacrament, for having given me Thy Most Holy Mother Mary as my Advocate, and for having called me to visit Thee in this church. I pay reverence to Thy most loving Heart today, and this for three purposes: first, in thanksgiving for this great Gift; second, to make reparation for all the outrages Thou hast received from all Thy enemies in this Sacrament; third, I intend by this visit to adore Thee in all the places on earth in which Thou art present in this Sacrament, and in which Thou art least honored and most abandoned. My Jesus, I love Thee with all my heart. I repent of having so often displeased Thy infinite Goodness in the past. I resolve with the help of Thy grace not to offend Thee ever again in the future; and for the present, poor sinner though I be, I consecrate myself wholly to Thee. I renounce and surrender to Thee my whole will, my affections, my desires, and all that belongs to me. From this day forward do whatever You please with me and what belongs to me. I ask and wish only of Thee Thy holy love, final perseverance, and the perfect fulfillment of Thy Will. I recommend to Thee the souls in Purgatory, especially those most devoted to the Most Blessed Sacrament and to the Blessed Virgin Mary. I also recommend to Thee all poor sinners. O my beloved Savior, I unite all my affections with the affections of Thy most loving Heart, and thus united, I offer them to Thy Eternal Father, and I beg Him in Thy name that for love of Thee He accept them and heed them. Amen. O Mary, Virgin most powerful and Mother of mercy, Queen of Heaven and Refuge of sinners, we consecrate ourselves to thine Immaculate Heart. We consecrate to thee our very being and our whole life; all that we have, all that we love, all that we are. To thee we give our bodies, our hearts and our souls; to thee we give our homes, our families, our country. We desire that all that is in us and around us may belong to thee, and may share in the benefits of thy motherly benediction. And that this act of consecration may be truly efficacious and lasting, we renew this day at thy feet the promises of our Baptism and our first Holy Communion. We pledge ourselves to profess courageously and at all times the truths of our holy Faith, and to live as befits Catholics who are duly submissive to all the directions of the Pope and the Bishops in communion with him. We pledge ourselves to keep the commandments of God and His Church, in particular to keep holy the Lord’s Day. We likewise pledge ourselves to make the consoling practices of the Christian religion, and above all, Holy Communion, an integral part of our lives, in so far as we shall be able so to do. Finally, we promise thee, O glorious Mother of God and loving Mother of men, to devote ourselves whole-heartedly to the service of thy blessed cult, in order to hasten and assure, through the sovereignty of thine Immaculate Heart, the coming of the kingdom of the Sacred Heart of thine adorable Son, in our own hearts and in those of all men, in our country and in all the world, as in heaven, so on earth. Amen. 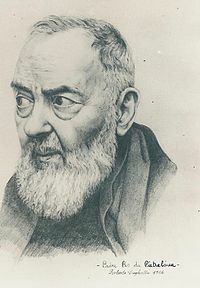 Padre Pio, teach us also, we pray, humility of heart, so that we may be among the humble to whom the Father in the Gospel promised to reveal the mysteries of His Kingdom. Obtain for us the eyes of faith that will help us recognize in the poor and suffering, the very face of Jesus. Support us in our hours of trouble and trial and, should we fall, let us experience the joy of the sacrament of forgiveness. Teach us tender devotion to Mary, mother of Jesus and our Mother. Accompany us on our earthly pilgrimage toward the blessed Homeland, where we too, hope to arrive to contemplate forever the Glory of the Father, the Son, and the Holy Spirit. Amen. O God, Thou didst give Saint Pio of Pietrelcina, Capuchin priest, the great privilege of participating in a unique way in the Passion of Thy Son, grant me through his intercession the grace of: [State your request…] which I ardently desire; and above all grant me the grace of living in conformity with the death of Jesus, to arrive at the glory of the resurrection. Say: Glory be. . . [three times]. Through the intercession of Saint Pio, I confidently beseech you to to grant me the grace of (State your request…). Help me to imitate his example of prayerful holiness and compassion, so that I, too, may faithfully follow the Risen Lord, and one day rejoice in the Kingdom, where you live and reign forever and ever. Amen. Beloved Padre Pio, today I come to add my prayer to the thousands of prayers offered to thee every day by those who love and venerate thee. They ask for cures and healings, earthly and spiritual blessings, and peace for body and mind. And because of thy friendship with the Lord, He heals those thou doth ask to be healed, and forgives those thou forgiveth. Through thy visible wounds of the Cross, which thou didst bear for fifty years, thou wert chosen in our time to glorify the crucified Jesus. Because the Cross has been replaced by other symbols, please help us to bring it back in our midst, for we acknowledge it is the only true sign of salvation. As we lovingly recall the wounds that pierced thy hands, feet and side, we not only remember the blood thou didst shed in pain, but thy smile, and the invisible halo of sweet-smelling flowers that surrounded thee, the perfume of sanctity. Bless me and my loved ones. In the name of the Father, the Son and the Holy Spirit. Amen.